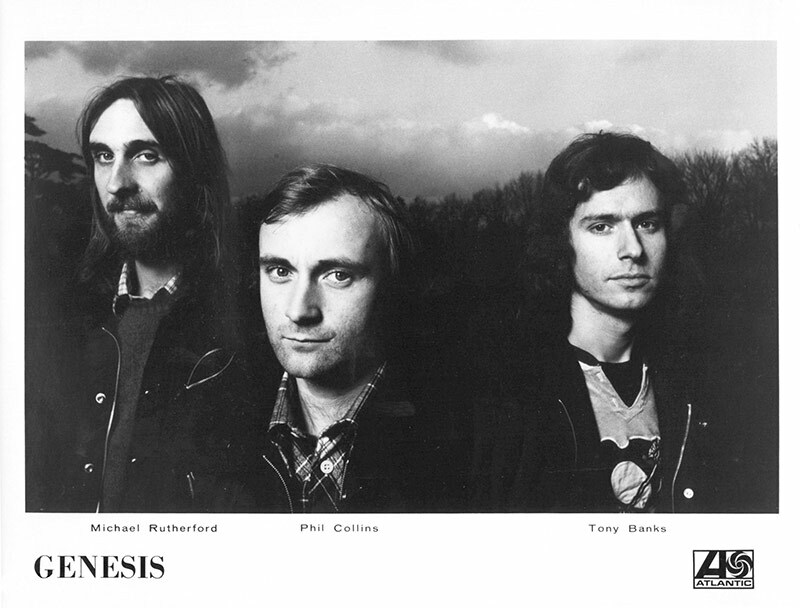 When I discovered the music of Genesis in the early 90's and started spending my pocket money on their LPs and, increasingly, CDs, And Then There Were Three was one of the last gaps in my collection. It may well have been that it was the last album I bought from their back catalogue – even after Genesis Live (1973). The artwork did not do much for me. When I listened to the album, I was not impressed either. As time went by I came to like some songs, some bits here, some of the lyrics there, but the album as a totality left me cold. Forty years have passed since its release, some twenty-five since I have bought it myself. Time for a reassessment. The album front does not show three people but only two. The “two” taller ones on the left-hand side is actually one and the same person who has moved between exposures. The man on the right is someone else – he's wearing a flat cap instead of a hat and appears to be sitting in the car Thorgerson mentions. A peculiar cover indeed. 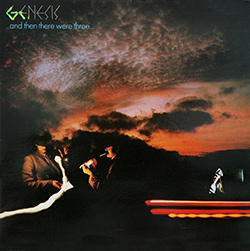 From Trespass up to this album, the cover art of all Genesis studio albums has always referenced the music on the album in one way or another. This brownish dark cover seems like art for art's sake without any reference to the music. Undertow begins pleasantly calm and simple. Vocals and gently guitar sounds paint the picture of a cozy, warm home with heavy cold outside. The first verse could well be described as a matured version of Your Own Special Way (but it is a Banks composition). There is, however, an undertow: There are people out there who are going to be cold tonight, who may well freeze to death tonight. If you were one of them, if you only had one more day to live – what would you do? The drums come in for this question and the music becomes more lively. There is a hunch of Afterglow in the chorus that lists what you could do that last day. Listen to that and it is hard to believe when Mike Rutherford explains: “We didn't go to town on the choruses either. At the end of each one we used some voice loops which we had made but we kept it low-key and subtle. “[TBT] There used to be a long introduction to Undertow, which the band (or two-thirds of the band) did not want to have on the album; it would soon reappear on Tony Banks' solo debut A Curious Feeling. In order to make sure people notice the connection the piece has been called From The Undertow. Apparently aimless piano chords and glimmering cymbals introduce the Ballad Of Big (working title: Ballad Of Big Jim). It is a classic western story: The notorious cowboy “Big” Jim Cooley bets that he can drive a herd of cattle “over the plain”. They leave in difficult weather. At their night camp they are all killed by a host of elite Indian warriors. Legend says his ghost still appears there. The drums drive the song along at a gallop, as it were. The verses have a simple melody with rhythmically divergent passages inserted (“must be mad …”). Keyboards dominate this song, with hardly any guitar to be heard except for a few sparkles here and there. Rumbling drums introduce Deep In The Motherlode; for once the drums do not fade too far into the background; you can even make out some guitar sounds. The powerful beginning of this introduction explains why this song had the working title Heavy. “Go west young man” – a song ostensibly about the gold rush. Many Too Many is my favourite song on the album. Quiet piano and synth strings accompany the vocals. Phil drums very gently and Mike gives off some lifesigns on the guitar. Between verses the song switches to “big sound” mode, like so many on this album. Mike remembers that they considered recording the song with a real orchestra but “we never got round to it” [TBT]. The title of Scenes From A Night's Dream alludes to Shakespeare's Midsummer Night's Dream. The lyrics use some stories from Winsor McCay's Little Nemo comic strips. Its hero, Little Nemo, undergoes many bizarre adventures in Dreamland, from which he always awakes in the last image. The music is mainly by Tony Banks. “This went through a funny change. We always liked it but Tony didn't like the lyrics he had for it and went off them – more than the rest of us actually – half way through. Then Phil came back with some different lyrics, a slightly different melody and some answering harmonies. … This song is a slightly lighter element that might not have got on to the album in the normal course of events.” (Mike in a 1978 interview [TBT]). Say It's Alright Joe is unlike everything Genesis have recorded so far. “It was the second to last song we recorded, the last one being a track that never even got off the ground”, remembers Mike. “This is meant to be a piss-take of the Dean Martin 'set 'em up Joe' alcoholic style.” [TBT] After one and a half minutes Tony's keyboards bulldozer away Dean Martin, the bar and all the drinks. The eruption soon subsides, though, and as if nothing had ever happened, Phil “Dean Martin” Collins sits at the bar again – until Tony's keyboard bulldozer reappears in another eruption that peters out in a long instrumental ending. A bit like the ending of Dancing With The Moonlit Knight, in fact. The beginning of The Lady Lies is meant to be slinky”, explains Mike, and to have “a strippers feel to it.” It is the second song after the Ballad Of Big in which Genesis tell us a story. This time it is a fantasy story with allusions to the fairy-tales in which gallant knight rescue beautiful maidens from terrible monsters. The twist in this story is that the beautiful maiden happens to be the terrible monster. Can the hero escape its snares? The answer is revealed in the grand finale where the sound rises to unprecedented dimensions. Says Mike: “The ending was meant to be cacophonous with the sort of jazz style that happens when the musicians get that really happy look.” A perfect ending? Definitely a typical Genesis album ending, going out with a big band (Los Endos! Afterglow! Supper's Ready!). As an album, a totality, And Then There Were Three is strangely awkward. So many things appear twice here: The pattern of “quiet verse with few instruments – gigantic sound in the chorus” (Undertow, Snowbound). The lyrical idea “winter is so beautiful – but it has another side to it” (again: Undertow, Snowbound). Similar song beginnings (Burning Rope, Deep In The Motherlode). On any other album the band would have said: Okay, one of those has to go. Musically, there are a number of issues: The band has lost its lead guitarist. The new lead guitarist is trying to get a grip on his new role. The drummer is preoccupied and does not introduce as many sophisticated drum fills, and the singer reaches into the highest heights of his voice. There are gaps in the music, and the keyboarder decides to stop these gaps by applying one sweet keyboard layer after the other to all the songs. Some of them, Burning Rope for example, benefit from it, and they begin to shine. Others suffocate and drown in the torrent of keyboards. Those would have been better off with a more transparent sound. And it seems there is a binary switch: piano – or the biggest possible sound with multi-layered synth strings and everything squeezed in but the keyboarder himself. There is little music that is in between those extremes on the album. That makes And Then There Were Three like a big box of chocolates for me: When I feel like it I have a chocolate or three. I enjoy them, but the whole box at once is simply too much for me. 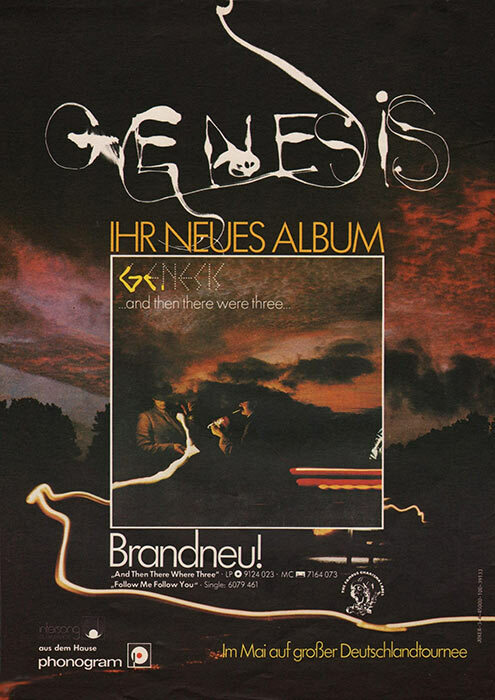 All this makes the album a new beginning: For Genesis, this is the start of almost twenty years as a trio, a period that will bring them immense success. It is also an ending: The last album before all three embark on their solo albums (Banks, Rutherford) or start recording songs that will, eventually, become a solo album (Collins). And the time in which Genesis record songs written completely by one member is beginning to come to a close. The percentage of songs that the band write together will increase until they develop all the material together from scratch on their self-titled 1983 release. And Then There Were Three may not be perfect as an album, but (most of) the individual songs from it are quite enjoyable. 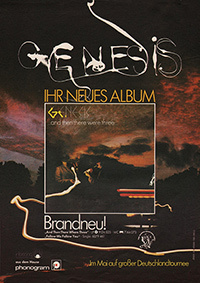 One should also note the peculiarity that in 1978, with punk shaking up the music world, with aggressive, visceral music fighting all this “romantic melodic muzak” and the pretentious offerings by album bands, Genesis, certainly an album band whose albums may be deemed pretentious offerings, go out and land their first single hit with a romantic melodic lovesong. What remains of this album? The romantic Follow You Follow Me. Snowbound with that wonderful bit of lore about the snow years. Ballad Of Big and Scenes From A Night's Dream, two songs that stand out at least slightly from the others – the final hurrah of Genesis bombast in The Lady Lies. What else remains? Obviously, the warming sun, the cooling rain, the snowflake drifting on the breath of the breeze, the lightning bolt that clears the sky for you, yet only eagles seem to pass on through, the words of love, the cries of hate, and the band in the moon who seduced you, then finally loosed you.